Fantasy lovers will rejoice when seeing the thrilling “Enchanted Unicorn” slots game offered by Wagerworks. This game offers a fairy tale themed slots game with a whopping ten thousand coin maximum jackpot. With denominations ranging from one cent to five dollars, players will find a wide variety of exciting payouts on offer. The graphics in “Enchanted Unicorn” slots offer a whimsical fairy tale feel. Symbols used in this game include scattered moons, treasure chests, unicorns, lions, princes, damsels, roses, mushrooms, mulberries, pinecones, and acorns. With a two thousand coin jackpot offered on a one coin bet, the five coin maximum bet offers players the chance for some truly fantastic payouts. There are a total of twenty paylines offered in “Enchanted Unicorn” slots. Three paylines run through the reels in a horizontal fashion, while the remainder is comprised of horizontal and diagonal lines. 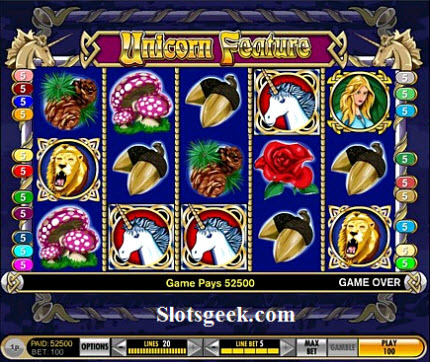 While there is no autoplay feature offered in “Enchanted Unicorn” slots, there are many bonuses and a number of high payouts to keep players entranced. The ten thousand coin jackpot is awarded when a player gets five lion symbols on a five coin bet. All single coin payouts are multiplied by the number of coins bet per line. The single coin payouts are as follows. Five lions pay two thousand coins when appearing on a single payline, while four pay two hundred fifty, three pay one hundred, and two pay five coins. Five princes or five damsels pay seven hundred fifty coins, four pay one hundred coins, three pay ten coins, and two pay five coins. Five roses pay two hundred coins, four pay fifty, and three pay ten coins. Five mushrooms or five mulberries on a payline offer a reward of one hundred coins, while four pay twenty and three pay ten coins. Five pinecones or five acorns pay one hundred coins to the winner, while four pay twenty coins and three pay five. Five scattered moon symbols are worth one hundred times the bet, while four multiply the bet by ten and three multiply it by three. Three treasure chest icons trigger the bonus game, which allows players to choose treasure chests along a grid, playing until the end of the grid is reached or the evil wizard symbol is found. 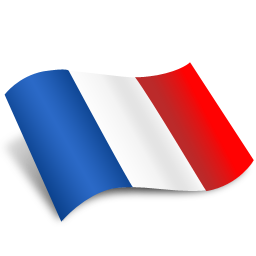 The game also has a wild symbol, which is the unicorn. This symbol appears on reels two through four and can substitute for all symbols except the moon and the treasure chest. This symbol multiplies line winnings by up to eight times for all combinations except the five lion jackpot, as each individual unicorn doubles the value of the payout. Players also have the option to gamble any winnings that are less than three thousand credits by choosing whether a randomly drawn card will be red or black. All chances are 50/50 in this feature. In all, there are many payouts offered in “Enchanted Unicorn” slots, and there is something on offer for virtually every slots fan, making this a very exciting addition to any slots players list of favorite games.